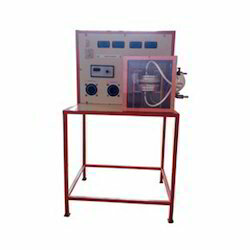 Pioneers in the industry, we offer emissivity measurement apparatus, thermal conductivity of insulating powder, hc refrigeration test rig, air- conditioning test rig, fluidized bed cooling tower and forced convection inside tube apparatus from India. 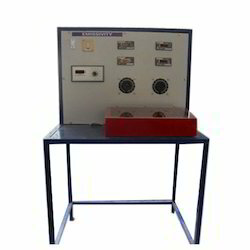 Emissivity Measurement Apparatus is the client-centric approach and market enterprise has betrothed our firm to manufacture, export and supply an excellent quality assortment of Emissivity Measurement Apparatus which is used to measure the property of emissivity of the test plate surface at various temperatures. The provided apparatus is highly applauded in the market for its accurate results, high performance and good service backup. The offered apparatus is manufactured by our dexterous professionals using superior grade components and leading edge techniques in adherence with international quality standards. Thermocouples : (K-type)-sensors 12 nos. Temperature Measurement : Digital Temperature indicator is provided to measure temperature of refrigerant and water. To study the Volumetric Efficiency of Compressor. 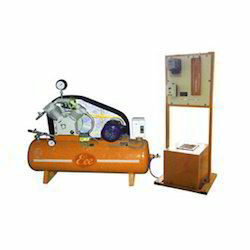 Both Single stage compressor and Two stage compressor can be used. 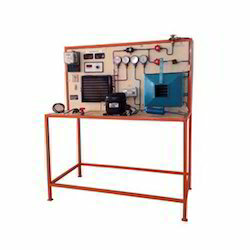 The setup consists of 6 channel digital temperature indicator with an energy meter and U Tube Manometer. 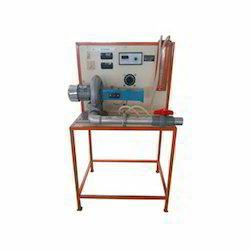 Average surface heat transfer coefficient for a pipe losing heat by forced convection to air flowing through it can be obtained for different air flow and heat flow rates. The unit consists of a circular pipe, loosing heat by forced convection to air, being forced through it. 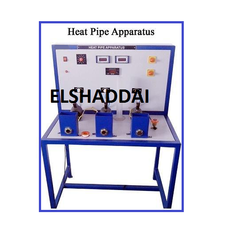 Constant heat flux is added to pipe by an electrical heater, provided with input control. The pipe surface temperature is measured at various points along length of pipe using thermocouples. Temperature of air at inlet and outlet of test section is measured using temperature indicator. The heat pipe demonstrator has been designed and developed to reveal clearly the superconducting device. It consists of three identical cylindrical conductors. One end of these is heated electrically while there are small capacity tanks acting as heat sinks at the other end. The unit consists of a heat pipe, a copper pipe and a stainless steel pipe. Thermocouples are embedded along the lengths to measure the temperature distribution and the heat transfer rate is noted in terms of the temperature rise in the heat sink tanks. The performance of the heat pipe as a super-conducting device could be studied well in terms of the temperature distribution along the length at a given instant and could be compared with other two members. Nearly isothermal temperature distribution and fast rise of temperature in heat sink tank reveals the heat pipe superiority over the conventional conductors. 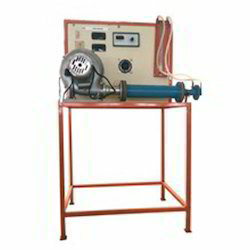 It is designed to study the temperature distribution along the length of a vertical pipe in natural convection. The unit consists of a vertical brass pipe heated by a cartridge heater inside it. It is fitted in an enclosure to provide undisturbed natural convection currents. Thermocouples are attached on the pipe to measure local temperatures. 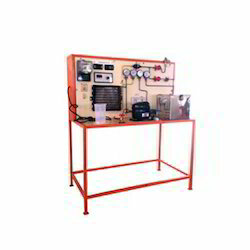 Heater input is measured on voltmeter and ammeter. 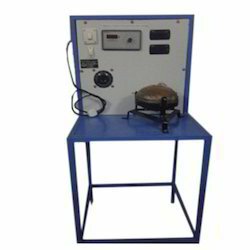 To determine the thermal conductivity of liquids by guarded hot plate. 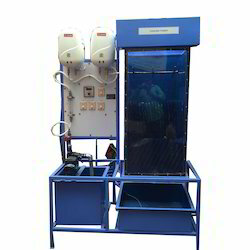 The apparatus consists of a main heater and a radial guard heater sandwiched between copper plates. 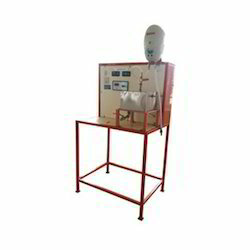 The specimen in the form of slabs of equal thickness are placed on either sides of heaters and cooling plates through which water is circulated are on the other sides of the specimen. The radial guard heater ensures all heat of the main heater to pass axially through the specimens which is collected by cooling plates. Compressor : Double Stage, Double Cylinder. iv) To study humidification and dehumidification. Slab assembly arranged symmetrically on both sides of heater. Cast Iron : 250 mm dia. & 20mm thick. Bakelite : 250 mm dia. & 15 mm thick. Press Wood : 250 mm dia. & 12 mm thick. 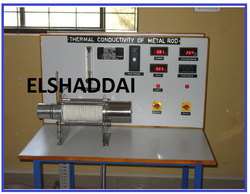 Heater : Nichrome Wire Heater. The slab assembly with front window of glass/acrylic. Digital Voltmeter : 0-300 Volts. Digital Ammeter : 0-2 Amp. Variac : 0-230 V, 2Amp. Temp Sensors : RTD PT-100 type. 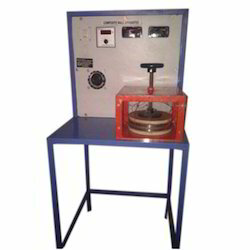 The test plate comprises of a mica heater sandwiched between two circular plates. Black plate is identical with test plate, but its surface is blackened. As all the physical properties, dimension and temperature are equal; heat losses from both plates will be same except radiation loss. Hence the input difference will be due to difference in emissivity. Both plates are supported on individual brackets in a wooden enclosure with one side glass to ensure steady atmospheric conditions. Temperature Sensors are provided to measure the temperature of each plate and surrounding. 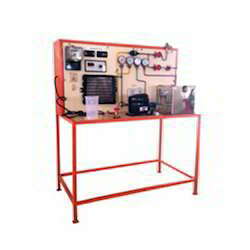 Supply is given to heaters through separate variacs so that temperatures of both can be kept equal and is measured with Digital Voltmeter and Digital Ammeter. Experiments Determining the Emissivity of a test plate. 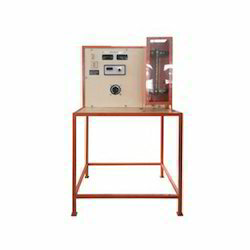 Study the variation of emissivity of test plate with respect to absolute temperature. A double pipe heat exchanger can be operated in parallel flow mode as shown in the diagram at the left. Similarly a shell and tube heat exchanger can be operated in approximately parallel flow by having both fluids enter at one end and exit at the other end. With parallel flow the temperature difference between the two fluids is large at the entrance end, but it becomes small at the exit end as the two fluid temperatures approach each other. The overall measure of heat transfer driving force, the log mean temperature difference is greater for counter flow, so the heat exchanger surface area requirement will be larger than for a counter flow heat exchanger with the same inlet and outlet temperatures for the hot and the cold fluid. Maximum cold fluid temperature - If we want to ensure that the temperature of the cold fluid never exceeds a particular temperature, then cocurrent exchanger designs are advantageous due to their inbuilt restriction to this effect. Fast heat transfer - Let's inspect the temperatures at location A. The temperature difference between the hot and cold streams at this location is very large in the cocurrent design. In fact, it's the largest possible temperature difference achievable! Since the heat transfer rate is directly proportional to the temperature difference, the heat transfer rate will also be maximum here. Therefore, to achieve fast heat transfer away from thermal equilibrium conditions, parallel flow configurations will perform better. Isothermal heat transfer - Suppose one of the two interacting fluids is undergoing a phase change due to the heat transfer (e.g. condensation of saturated steam), then both designs are identical. In this case, there is no change in temperature for one of the two streams and hence, no difference in the performance between configurations. To calculate Gr, Pr & Nu number in natural conviction. Calculate Re , Pr & Nu number in forced conviction. Calculate the value of m & obtain the temperature at various locations along the length of the fin in natural & forced conviction. Calculate the values of heat transfer rate from the fin & the fin effectiveness in natural & forced conviction. The REFRIGERATION test rig works on simple vapour compression refrigeration cycle and uses R134a as a refrigerant. It is environment friendly. 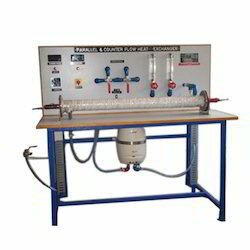 The system is fabricated such that students can observe and study vapour compression cycle, its component principle & working. The arrangement of parts such that, all the parts are visible and working can be easily understood. 1/4 HP; Hermetically sealed. Make: Emerson Climate Technologies Ltd. /or Danfoss Ltd;/or Tecumseh Products India Ltd./ or any equivalent make. 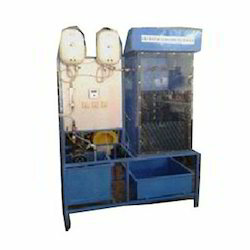 Water Tank Stainless Steel 12 Ltrs. Cap. Heater (2 Nos.) Nichrome Wire immersion heater. The Apparatus follows widely accepted theory of heat conduction in liquids based on Debye’s concept in which the hydroacoustic vibrations (phonons) of a continuous medium(base fluid) are responsible for the heat transfer in liquids. Based on this heat transfer mechanism,Bridgman has obtained a formula,characterized by the direct proportionality between thermal conductivity and sound velocity in pure liquids.